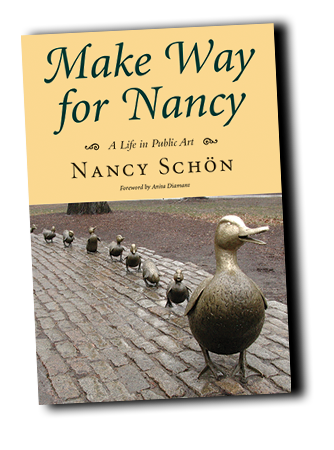 Nancy Schön's new book, Make Way for Nancy, about her life's work in public sculpture, is about to be published by David Godine Boston. Click here to learn more and to order a copy. Nancy has now created a Sculpture-to-Wear®, based on Mrs Mallard from her famous sculpture in the Boston Public Garden. It is an adorable pendant, available for custom order. Watch Nancy tell you about this new item. Nancy has unveiled her extraordinary sculpture series, based on Aesop’s Fables. She has created 24 sculptures, and a video series. Learn more about this new project and watch the videos.